I was tired when I woke up on Day 38. It was not a good start for the day. Fortunately this would turn out to be a good day anyway. Sunrise fighting the clouds over a corn field. We left Boente and stopped in Arzúa where I'd stopped last time. We found a grocery store and stocked up on food and then stopped in a bar/restaurant and had breakfast. While I started out tired I felt better as the day went on. We passed the automated advertising that nearly scared the poop out of me last time. It was a recording about an albergue activated by a motion detector hidden behind a sign. This time there was a television in a glass box showing a video advertisement and more signage and music playing ... much less surprising. We were talking to a pilgrim we knew. He had met Brierley and had his guide book signed. Brierley writes the most popular Camino guide on the Camino: "A Pilgrim's Guide to the Camino de Santiago: The Way of St. James ". He was walking the Camino again to update his guide. I have to admit I cursed his name at times. So many pilgrim's follow his book religiously which results in huge waves of people stopping in the same towns and sometimes even the same albergues. We tried to bypass most of the Brierley stages this Camino aiming for the smaller places in between stops recommended by the guide. That, unfortunately didn't help too much as many of the savvy pilgrims also tried to avoid the Brierley stages and these smaller places filled up too. I was hoping to run into him and make some suggestions but I never saw him. Our goal for the day was Santa Irene. We reached there and examined the two albergues. One looked a bit run down. The other looked nice and had a nice kitchen but, when we asked how far it was to the nearest food store we were told it was two kilometers away. This seemed ridiculous since the next town was three kilometers away. It took only a little thought and discussion before we set out for the next town. 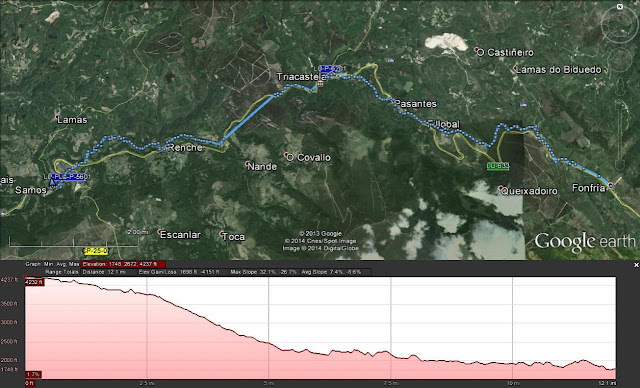 The three kilometers were mostly down and fairly easy and I am grateful for that. This would be our second long day in a row and I was a bit tired. Having said this, I felt a lot better than I expected I would this day. It helped that my blisters were practically gone and my feet were feeling pretty good. As we entered the town of O Pedrouzo we started running into pilgrims we knew. It seemed most of the people we'd met along the Camino were all converging on this town. It was nice saying hi and exchanging stories. Everyone was excited about tomorrow and the walk into Santiago de Compostela. The rest of the afternoon was occupied with chores, naps, eating lunch and dinner, and chatting with people. Most of the people we knew were divided between two albergues but there was a bar about halfway in between where everyone seemed to congregate. The weather turned ominous and rain came and went most of the afternoon. The rain would be a foreshadowing of the next three or four days. 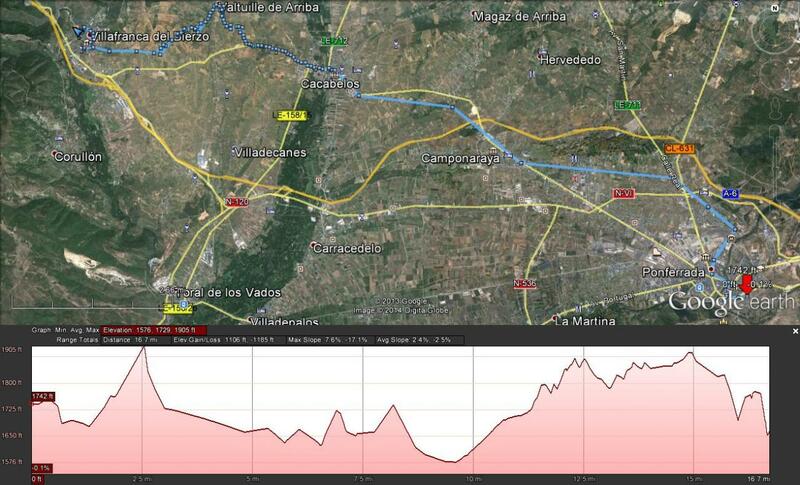 Our weather luck that we had early on and after the meseta was starting to turn once again. I went to sleep, once again, to the sound of hard rain outside the albergue. Approximate Track of the day's hike*. *Note: The camera GPS did not work very well this day either. A large section between Boente and Arzúa and beyond did not track properly. On day thirty-seven things started to get real for me. We were only three days away from Santiago de Compostela - not our final destination but still an important milestone. On my last Camino I had mixed feelings right about now. I missed home and the Wife but I would miss walking the Camino an equal amount. In 2013 things felt different. I was missing home and the Wife a lot more. 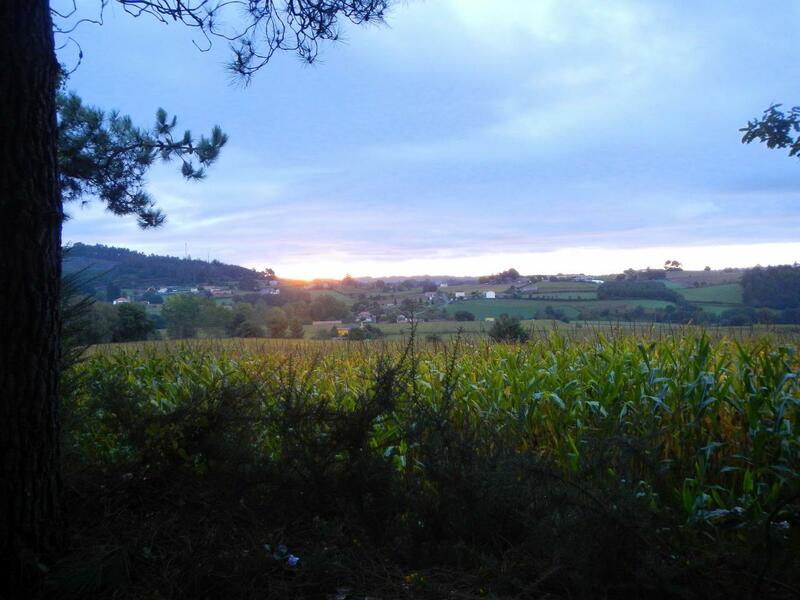 I was enjoying the Camino but not as much as last time and not as much as I missed home. 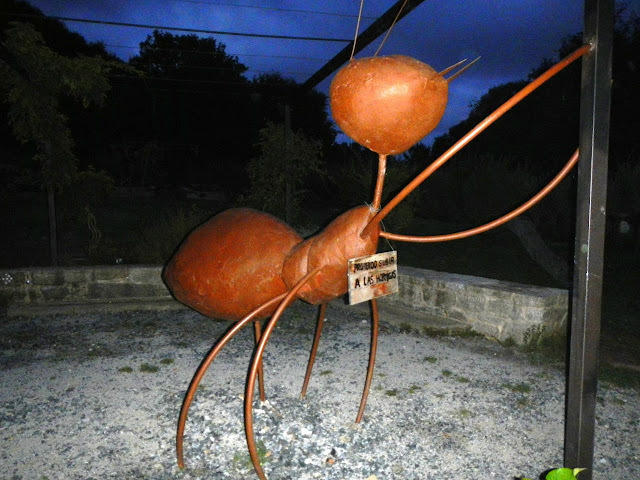 Giant ant sculpture along the Camino. We left Airexe and walked to Palas de Rei where we'd stopped last time. We got a stamp in the local church - the caretaker of the church was an odd character who stamped each credential with two stamps. 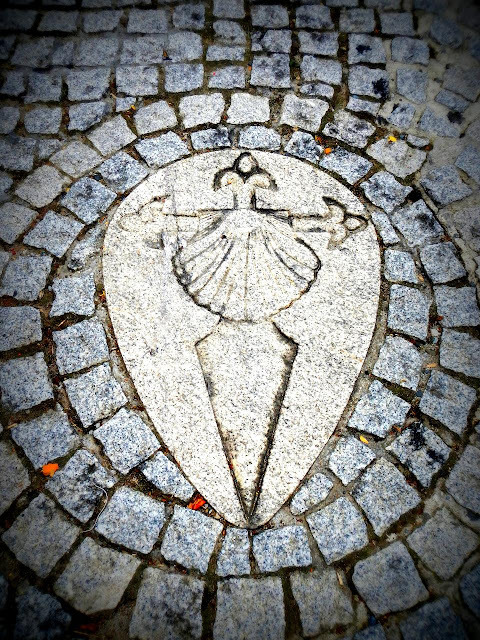 A Camino marker with the shell and the sword-like Santiago cross. We found a bar and stopped in for some warm croissants and orange juice. As I was waiting to pay, the Trophy Wife and her Sugar Daddy were at the bar. The Sugar Daddy said something to the effect of "What a miserable way to walk ... and for nothing." I looked at him and said "If you are walking for nothing then you are walking for the wrong reason." He got a strange look on his face, sort of agreed with me, and hurried himself out of the bar. What a bore. Fortunately I never saw those two again. We talked to Cn (one of the Colorado brothers) at the bar as we ate. They'd spent the night in Palas de Rei and were just getting up ... at 9:00AM. Oh well, they were young and fast. 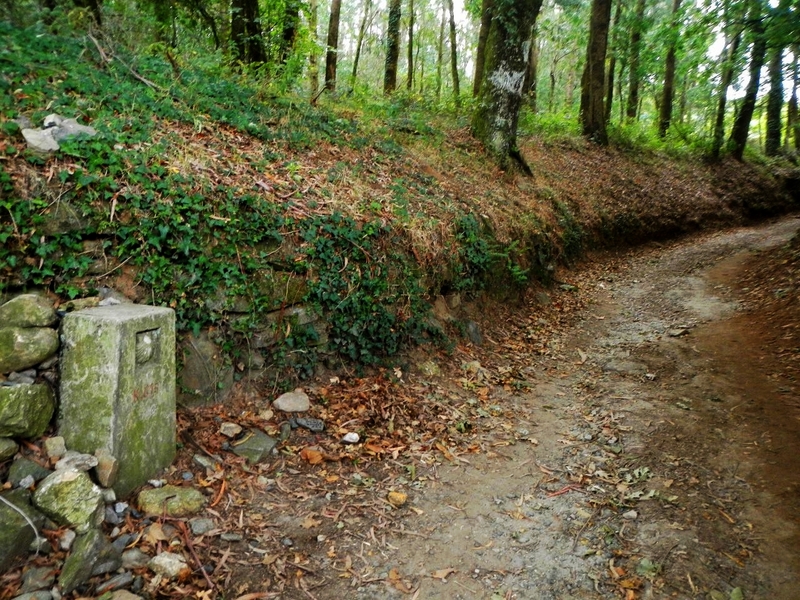 The Camino near the 61.5 km marker. The rest of the walk was uneventful and, despite it being a long 29 kilometer (18 miles) I felt pretty good. I guess it was mostly downhill which always helps. Downhill can be a bit hazardous though. This sign warned of one stretch where a pilgrim hurt his ankle and wrist within three minutes of each other (sorry about the poor quality of the picture). In Boente we stopped at the first albergue we found which was across the street from the church. 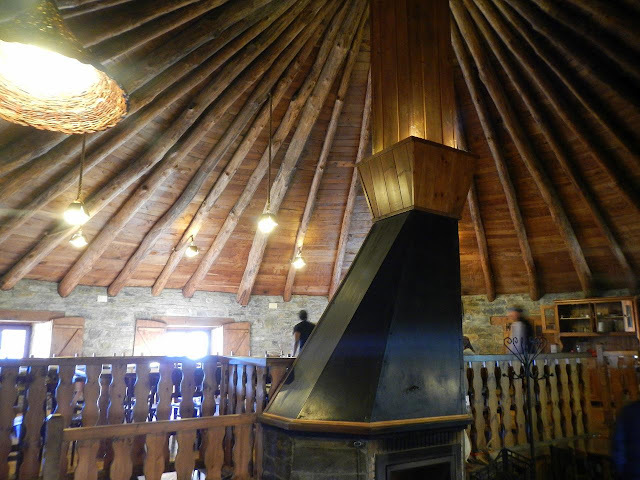 The albergue was attached to a bar/restaurant with a cheerful owner. As we were eating some lunch a group of three pilgrims came in. One of them had checked into the another albergue. The hospitalero in the other albergue had taken her passport with her fee. When she found out her friends were in the our albergue she asked for her passport back and he wouldn't give it back. Our hospitalero ended up calling the other and threatened to call the police. The pilgrim went back and picked up her passport ... after having to threaten to call the police again. She was lucky ... the next day we met people who'd stayed at the other albergue and had ended up with bedbug bites. After we finished lunch and did our chores, I laid down for a nap. When I woke up it was raining outside. The rain was coming down pretty steady and it would keep me from walking around the town. Having said that, I was tired enough that I really wasn't interested in walking around much. We ate dinner in the bar. The hospitalero teased me when I didn't finish everything on my plate but smiled when I said I was saving room for a piece of Torta de Santiago. I fell asleep to the sound of rain against the albergue window. *Note: The camera GPS did not work very well this day. A large section between Airexe and Melide did not track properly. Book: Susan Richards' "Lost And Found In Russia"
Continuing my oppressed nation tour, my next read was Susan Richards' "Lost and Found in Russia: Lives in the Post-Soviet Landscape ". Richards attempts to tell the transition Russia went through after the breakup of the Soviet Union through the stories of six people who she met and befriended in her travels. I say she attempts because her narrative is a bit disjointed and scattershot. She starts off trying to see the transition through the experiences of Russian Germans who were settled in the town of Marx south-east of Moscow and on the banks of the Volga river. This doesn't really pan out as no one wants to talk. The book appears to digress briefly as Richards delves into Russian occult beliefs, cults, orthodoxy, UFOs, glowing sky people, and psychotronic weaponry. This threw me for a while but as the book progressed it made more sense. The 90s in Russia were chaotic years. The religion of the Soviet Union, Communism, has been dismantled leaving millions of people rudderless. There was this dream of liberal democracy in the distance but up close all they saw was corruption and decay. The Russian people grasped at anything to give order back to their lives and this was often ancient religions and cults or sci-fi alien and psychic weaponry of some imagined future. You realize that the 90s in Russia was filled with people flailing around to find something new to believe in and to guide them. Eventually, when liberal democracy does not come to the rescue, autocracy in the form of Vladimir Putin steps in. You can see the hopes of the democrats fade and their realization that they have returned to soviet times, though with a capitalist twist. The book ends in 2008. There is no positive, hopeful ending in this book. You realize that the West had an opportunity in the 90s that was squandered and we have to admit that Russia will not be a liberal democracy anytime soon. Richards' writing is as chaotic as Russia in the 90s. She often jumps to and fro with little warning. You almost feel that she believes some of the paranormal stuff the Russians have turned to. After reading "Nothing to Envy" which also is written using interviews and experiences of the local people, I was a bit disappointed with Richards' book. A little more coherence and bit more objectivity would have made this a better book and not just a quirky interesting read. We woke early on a foggy morning and went next door to the bar/restaurant to get some breakfast. The bar was affiliated with the other albergue in the town and was open early to support the pilgrims. This is where I started my sugar binge. It started with a huge piece of Biscocho. Biscocho is Spanish for cake and is a type of coffee cake usually served with coffee (duh) in the morning. It can sometimes be dry but this piece was moist and delicious. The walk was a nice one today. Our first stop would be Portomarín. I'd stopped there last time and I liked the town. On the way I started to see the Roland graffiti on Camino markers. Someone was writing little sayings about Roland who I presume, was another pilgrim. Things like "do what Roland says, not what he does" and things like that. Some were quite clever. A foggy entrance into Portomarín. The lower bridge is often underwater. 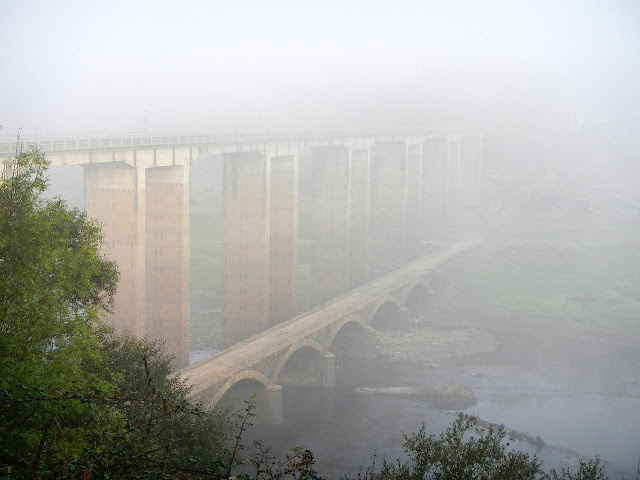 You could hardly see the town through the fog as we crossed the bridge into Portomarín. We stopped at a restaurant to use the facilities and get something to drink. We stopped at a grocery store on the way out to get supplies including my ... third? ... tube of Principe cookies. The Camino is that way. 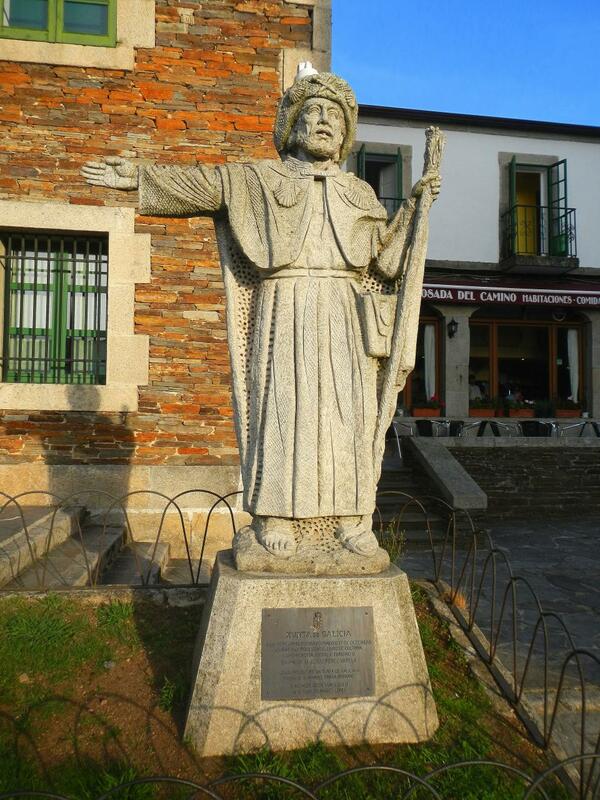 It was in Portomarín where I first noticed the Tourigrinos (Tourist pilgrims). I'm sure I saw some earlier than Portomarín but it was here that I remember seeing the really blatant tourists. These tourigrinos were getting off a bus. We would learn that this bus was dropping off tourigrinos and then picking them up ten to fifteen kilometers later on to take them to a nice lunch or, if it were the end of the day, a nice hotel. They also seemed to only be walking flat or downhill sections of the Camino. None of them were carrying packs, of course, and many only had a bottle of water or a small day pack. We ended up following and passing most of these tourigrinos this day. One pair of tourigrinos caught my eye. She was in her thirties ... low thirties I would say ... and dressed in fashionable workout clothes except for the white tube socks pulled up over her tights. With her was a man in his late fifties - early sixties and not in the best physical shape. While she was young enough to be his daughter, we were pretty sure they were married. We started calling her the Trophy Wife. I understand the arrow but I'm not sure about the significance of the chicken. 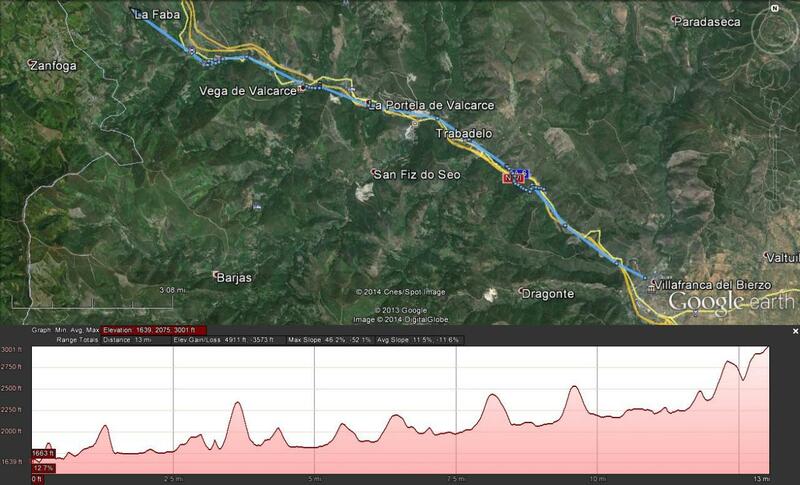 The Camino route has changed slightly on the way out of Portomarín. They take you over a car bridge instead of the rickety foot bridge that I crossed the last time. A Shame ... I liked that bridge. 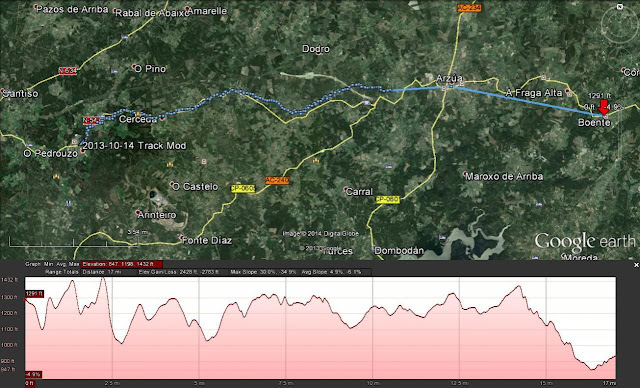 Outside of town the Camino briefly goes up hill and I motored up that hill. I think I was trying my best to catch up with the Trophy Wife and her Sugar Daddy. I was disappointed that, even fueled by a tube of Principe cookies, I was unable to catch up. They had had a substantial lead leaving the town before us. 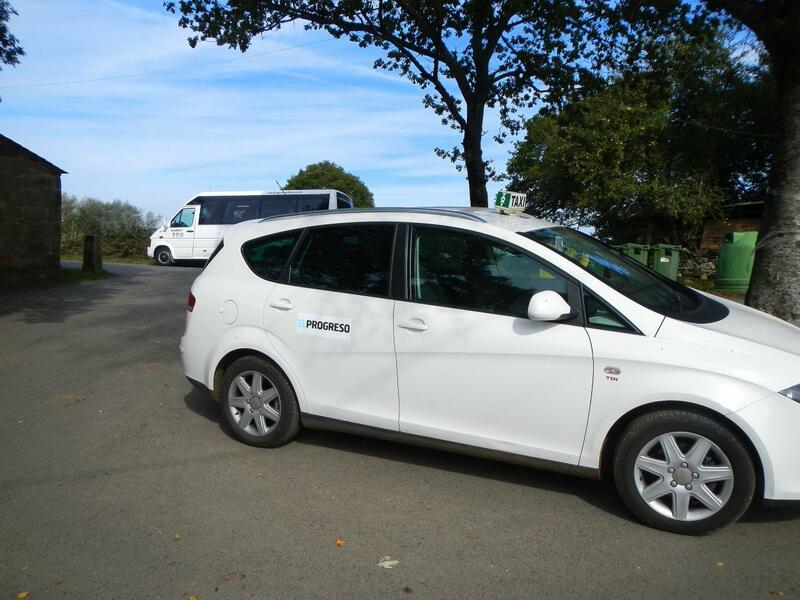 The enemy of the 'true' pilgrim: the taxi and the tourigrino bus. I finally did catch up with them in the town of Gonzar where they ate a snack at the bar and got back on their bus. We stopped there for some lunch and a stamp on our credential. It was interesting watching the man who ran the bar. He obviously did not have a taste for tourigrinos. When he saw us walk in with our packs he was much nicer with us, told us to please sit down, and that he would bring our food to us. I noticed a lot of this behavior along the Way ... especially after Sarria. The locals treated 'real' pilgrims nicer than that tourigrinos. We walked on, leaving the tourigrinos behind us. At the town of O Hospital we passed a group of volunteers painting or repainting yellow arrows. I smiled at this and thanked them. We exchanged Buen Caminos but I forgot to take their pictures. 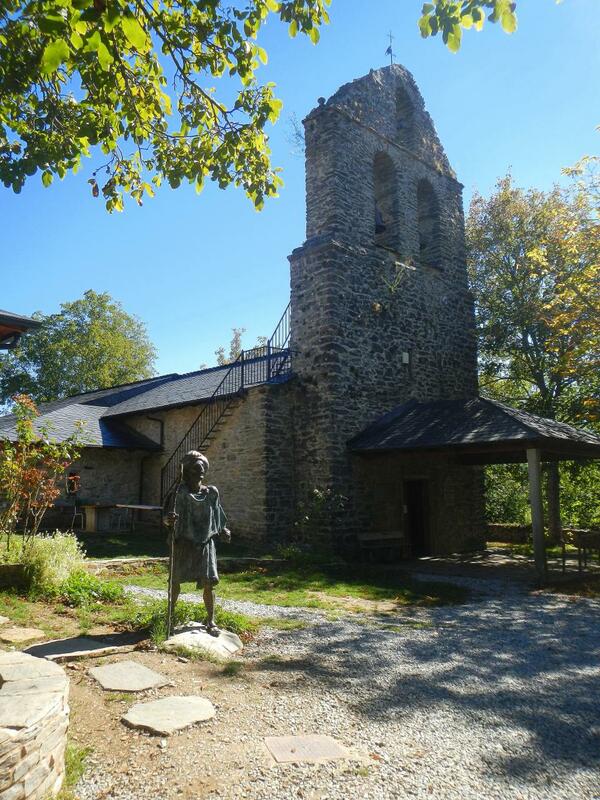 We passed a few pilgrims we knew in the town of Ligonde. Ma was here. 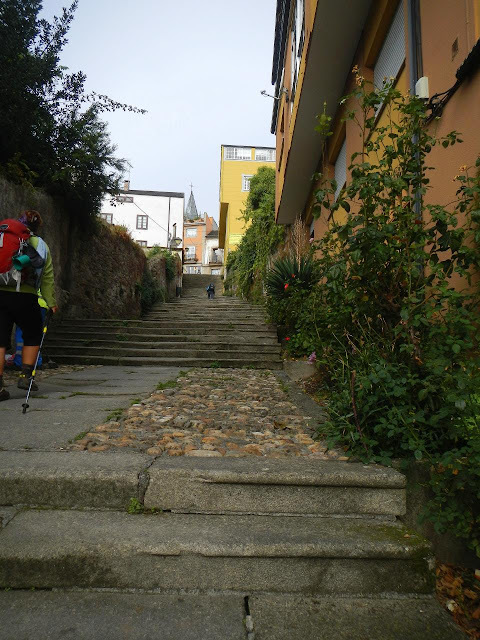 She had joined up with her sister and brother-in-law in Sarria and they were completing the last 100 kilometers together. We talked to them and a few other pilgrims we knew before we headed a couple kilometers farther to our end for the day in the tiny village of Airexe. Airexe was very small. They had two albergues, a restaurant, and a church (which I did not visit). That was it. I did my chores and I bought an ice cream bar in the bar and something to drink before taking a nap while my laundry dried. 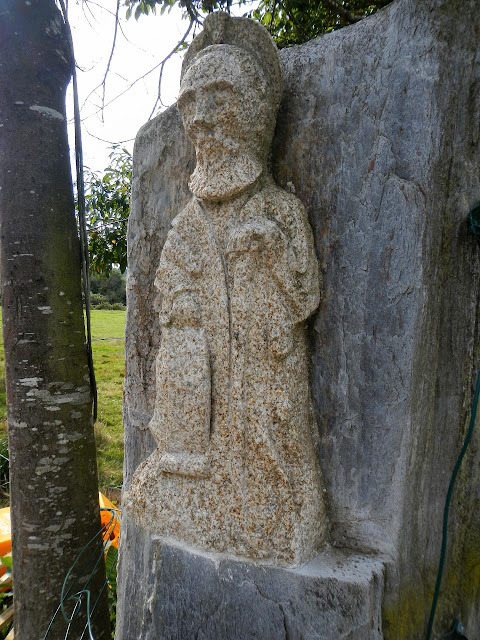 A sculpture of Santiago in the town of Airexe. That evening we had a good meal in the restaurant including some chocolate cake. That topped off my sugar for the day: biscocho, principes, chocolate (I had a bar in my pack that I ate), and chocolate cake. I'm kind of surprised I could sleep that night with all the sugar in my system. We were heading for bed when more people showed up at the albergue. It was Ma, her sister, and brother-in-law. Their albergue in Ligonde had lost all water so they were told to move on. With them, there were only seven people in this albergue. It was a fairly quiet night and I did sleep well after a very nice walking day. Back in 2008 I sold my first pictures (You can read about it here). I haven't really sold any since then though I did give some away to web sites and such to get any exposure I could. You never know where an offer could come from. Nearly six years later I've sold four more pictures. A week ago or so I was contacted by someone from American Spirit magazine, a member's magazine for the Daughter's of the American Revolution. They'd seen some of my Laura Plantation pictures on Google Photos and wanted to use them for an upcoming issue. These will be the first actually printed in a hard copy publication. Very Cool. They made me an offer which was pretty good, better than the one from 2008, and I accepted. I'm a little sorry I didn't ask for more though. When they made their offer, the representative thought they were using two pictures. Since they are using four I probably should have asked for a bit more ... but then, I'm not really a greedy man ... and I thought of this after I'd accepted their offer. A little PayPal and Dropbox action and the transaction was completed early last week. Some of this newfound fortune will go towards a sleeping pad for when I start camping later this year. At least I hope that's what it will go towards. The money I made in 2008 ended up going towards something totally unexpected and unwelcome less than a month after getting paid: a speeding ticket. Camino 2013 - Day 35: Samos To Ferreiros. We were woken up before sunrise by church music coming out of a cheap boombox. The convent albergue didn't like pilgrims to dawdle. We left when it was still a bit dark. It was a foggy morning and things felt damp. 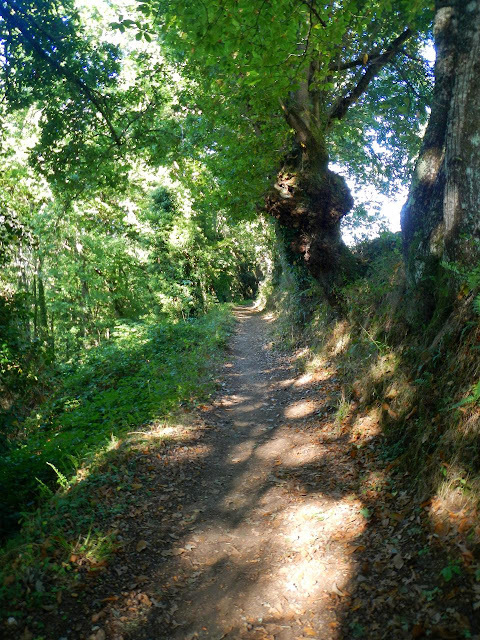 After you leave Samos you have a couple of choices: take the highway all the way to Sarria or take a branch of the Camino that joined the other route, the one I took last time, before it too arrives in Sarria. We took the branch because it would be much more scenic. 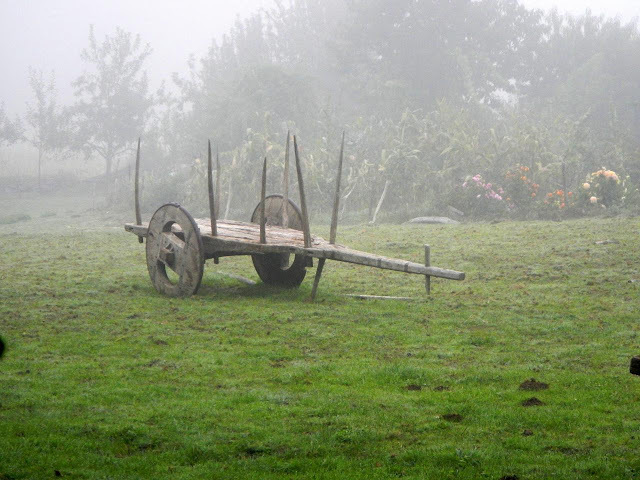 It turned out to be quite scenic passing through forest, pasture, and farmland all cloaked in fog. 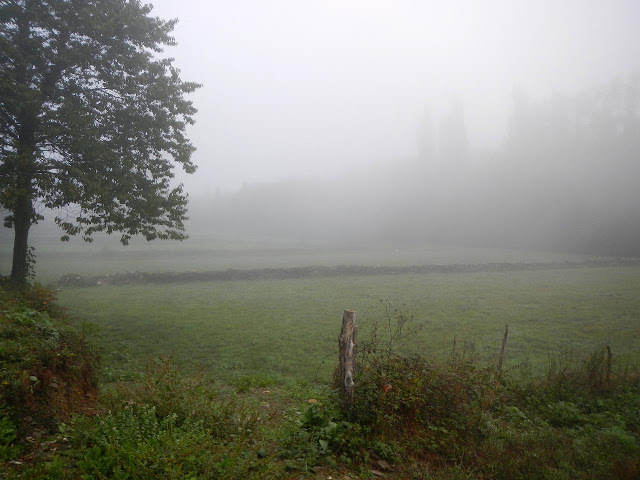 A foggy morning along the Camino. This portion passes through "towns" on the map but these towns are usually just a group of farm buildings and there were no places to stop for food or to just get in from the chill of the morning. Along this portion we met a group of young French who we would see off and on the rest of the Camino. The branch of the Camino from Samos joins the other in the town of Aguida where we stopped in a bar to get some breakfast. It was nice to be in from the chill and the food and drink tasted good. On the way Sarria we passed two signs. One was for Airexe the goal for day 36 and Ferreiros the goal for today. Since we were not following either road I wondered if we had followed those signs would it have been a shorter walk? Would we have bypassed a whole day? The pilgrim's path is not always the shorter or easier path. In Sarria we stopped in a grocery store to restock then in a outfitter so Gv could buy rubber tips for her Trekking poles. Gv didn't go through as many tips as I did since she took them off when we weren't in the city. I left my tips on all the time and wore through them a bit faster. My reasoning ... I didn't have a convenient place to put the often wet and muddy tips when I wasn't using them. My pack belt pockets, which would have been perfect, carried other things that I would prefer to keep clean ... like Werther Originals. Climbing the stairs into old Sarria. We climbed up the stairs into old Sarria, passes all the albergues in the town, and then headed out. 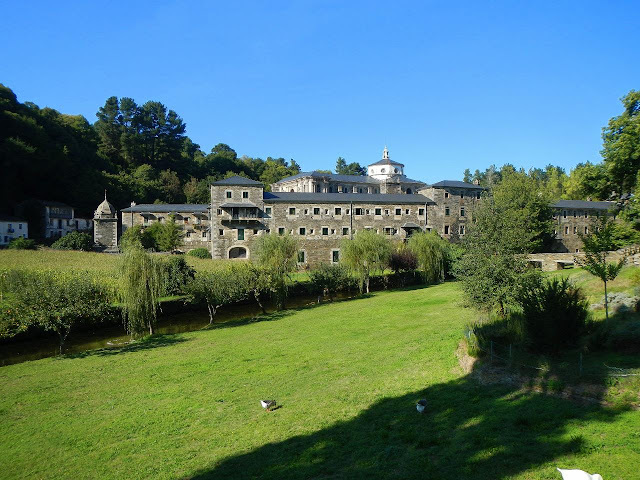 Sarria is the traditional starting point for people who only want to do a short portion of the Camino and still do the 100 kilometers required to get the Compostela certificate of completion. Sarria is roughly 108 kilometers (67 miles) from Santiago de Compostela. I'd been dreading this last portion for awhile. The number of pilgrims tend to jump up here and the number of pilgrims in clean, well fitting clothes and new shoes goes up rather dramatically. I was a bit worried about getting beds each night. The Sarria surge turned out not to be as bad as I expected - probably because it was so late in the year - and beds were not hard to find. 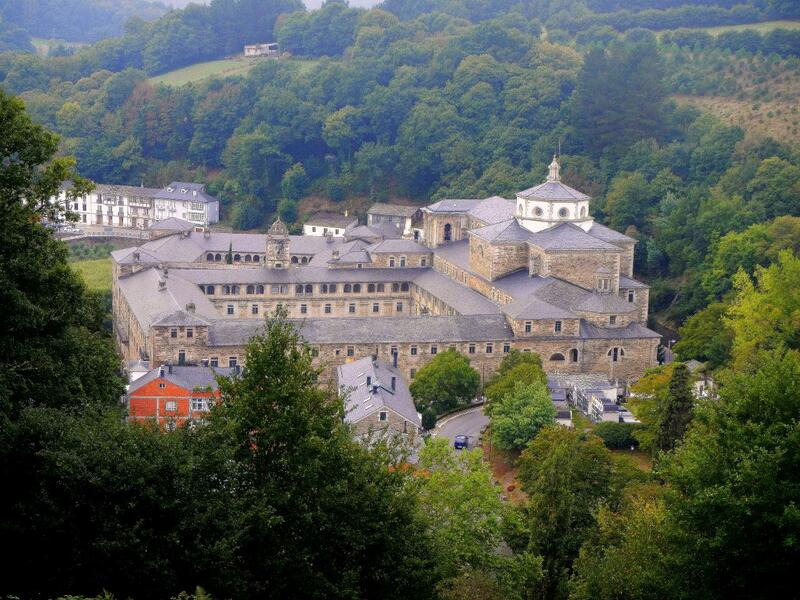 The rest of the day was spent passing all the Sarria newbie pilgrims on the way to Ferreiros. Some asked us what the rush was. We responded that we just had a fast natural pace after walking for 34 days. I was surprised at how many pilgrims started late and arrived late at the albergues. Last time I thought most pilgrims started early and got to the albergues early. Maybe my memory is a bit skewed or maybe it was because the sun rose later. A hay wagon in the fog. 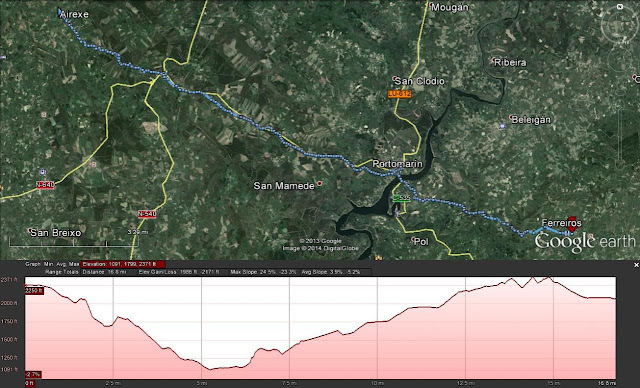 Just before Ferreiros you approach the 100 kilometer marker. As we were approaching I passed a man resting on the side of the road. I noticed a woman ahead of him. It took me a few seconds to realize the woman was Nc. The man I'd passed was her husband Rh. We hadn't seen them since Undués de Lerda way back on day seven of the Aragones. They had taken a short day to Sangüesa to see the bullfights - and ended up leaving the bull ring after it turned too violent for their tastes. Later on they'd skipped ahead on a bus. It was one of those Camino moments. We kept running into people we never expected to see again. I didn't remember much of Ferreiros from last time. I'd just walked through without noticing much. We checked into the municipal albergue and did our chores. The social gathering place here was a bar/cafe/restaurant next door to the albergue. We spent the afternoon and some of the evening here. We ate lunch and dinner here. After dinner we ran into Rh and Nc again and we sat with them as they ate (we'd already eaten) and caught up. I told them about my shell destruction. I stepped away to use the computer to make reservations in Santiago de Compostela. When I got back Rh handed me something. It was a shell necklace. J-M had given Rh and Nc two necklaces. Rh said they didn't need two and would like me to have his. I was so touched. Camino angels ... and another Camino moment. Later that night I threaded the shell onto my yellow cord I'd used for my original necklace, the one that had been blessed by the Bhutanese monk. I felt so much better with that shell around my neck. This was a wonderful day and I slept well with my shell necklace in a safe place. The walk from Fonfría to Samos was gorgeous. The sky was blue for most of the walk. There was fog in the morning but we were walking above the clouds. The valleys below us were filled with white cotton. 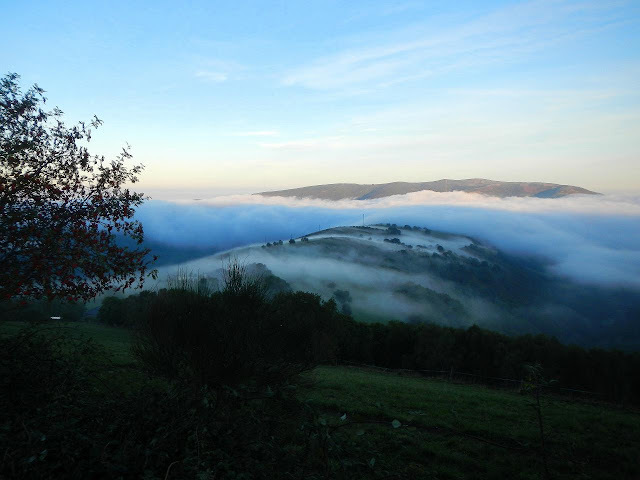 In places the white clouds flowed over the hills like water. Last time this had all been obscured by drizzle and clouds. This time the scenery filled me with awe. Clouds flowing over the hill. On the way down we stopped to talk to Vn who was on the side of the trail taking in all the sights. You could tell he was in enjoying everything he saw and I totally understood how he felt. Most of the day was downhill. As we went down the fog slowly dissipated. It was still a bit hazy when we reached the bottom in Triacastela. We looked around to find a bar/cafe that looked good. Many places I remembered were closed that early in the morning. We finally stopped in a place and ordered breakfast and something to drink. At Triacastela the Camino splits. All of the pilgrims we knew were heading in the direction that I took last time. Gv and I took the other path that would take us to Samos. 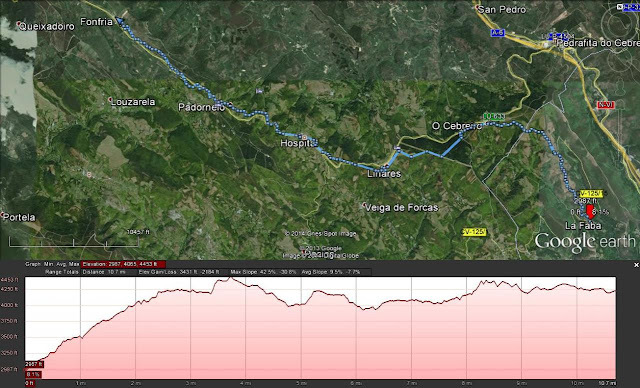 This would be one of those 'new' sections for me and, except for the part between León To San Martín del Camino, the new sections were my favorite. 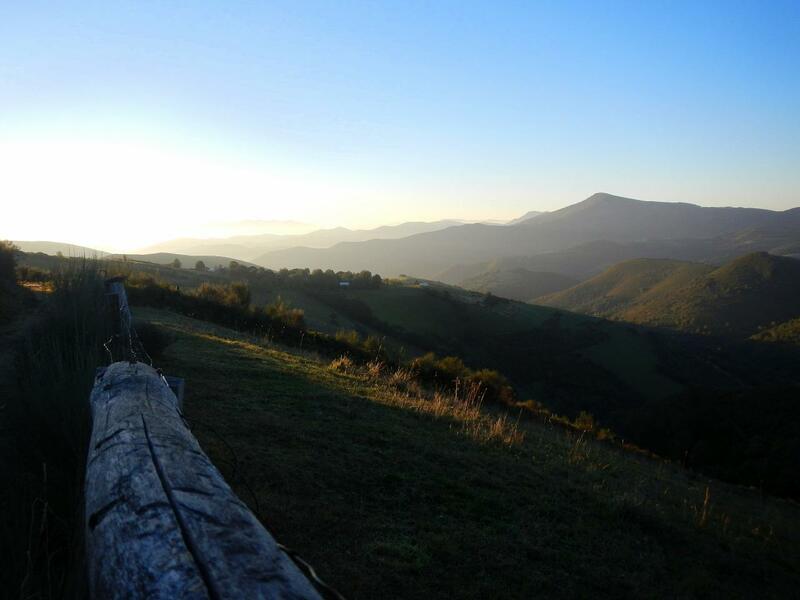 At first the Camino followed the main road but you soon left it and the more rustic trail passed through small villages, rivers, forests, and pastures. The only downside we had was nothing was open in any of the villages we passed through including bathroom facilities. This must have been a problem as signs similar to these appear often near one village. The Monastery of Samos from the overlook. As we approached Samos there is an overlook where you get a great view of the monastery. When we got there the clouds had not quite cleared yet and it wasn't as nice as it could have been. The Camino drops down from this viewpoint and enters the town. Between Triacastela and Samos we hadn't seen any other pilgrims but once we arrived in town we passed several - all new to us. We walked around looking for albergues. We decided to stay in the convent albergue that is in the Monastery building. One of the monastery murals. 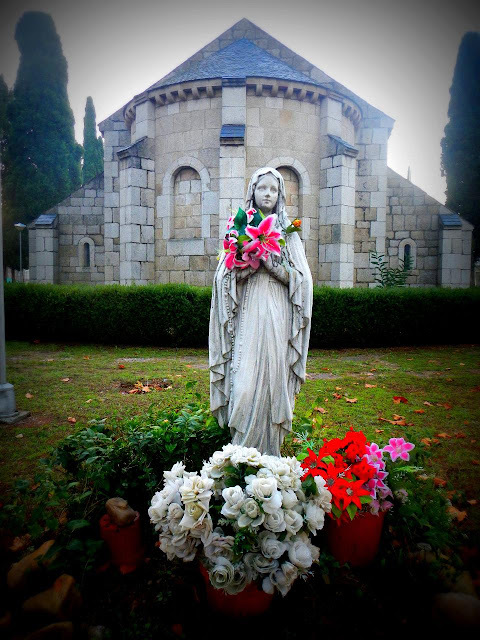 One nun is thought to be modeled after Sophia Loren. After our chores and lunch in a restaurant/bar across from the albergue we walked around town and took a tour of the Monastery of San Xulián de Samos. The guided tour of the active monastery was very interesting. The sixth century monastery has been restored and destroyed many times over it's life. 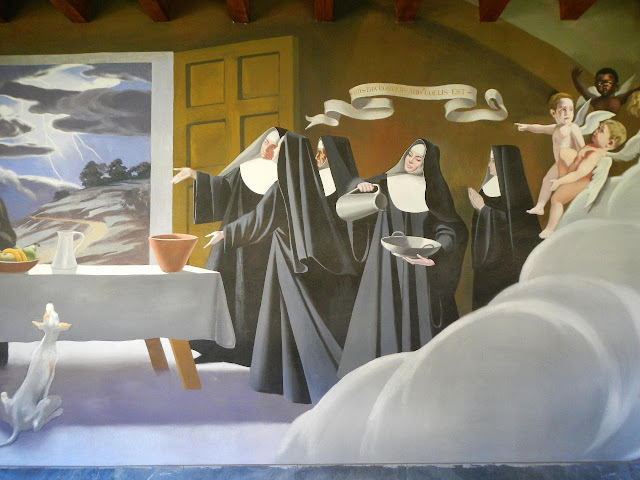 The monastery is famous for its murals painted by various artists after the last restoration. The guide only spoke Spanish but she spoke it so well that you could easily understand her even if you only had rough Spanish skills. The monastery in the sunlight. After having dinner Gv and I went back to the monastery for mass. It was actually a very nice mass. Most of the people in the church were pilgrims. All the singing was done by the monks and they sounded incredible accompanied by the 3,000 pipe organ. After the mass a monk stayed behind and led a pilgrim's prayer and blessing. Another high point of the Camino. 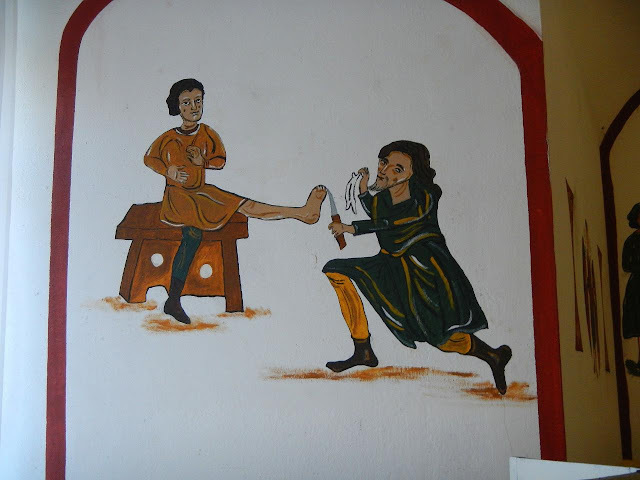 A Mural in the albergue. Gv used a smaller knife. This had been a great day. The Galician scenery and the monastery made for a day of beauty and awe - the best kind of day. I'd taken a short nap this afternoon so as not to spoil my sleep. It worked as I fell asleep fast and slept well this night. Book: Barbara Demick's "Nothing To Envy"
After hiking the Pacific Crest Trail with my last book, I decided to choose something less serious to read for my second book of the year. To lighten things up I read Barbara Demick's "Nothing to Envy: Ordinary Lives in North Korea ." Demick, a journalist working out of South Korea, interviewed several North Korean defectors to build an image of life in the oppressed nation. To narrow down the scope of the book she chose Chongjin, the third largest city in North Korea, as her focus and painted an image of the life in the city over the last twenty-something years. The interviews tell of a slow deterioration under the leadership of Kim Il-Sung and Kim Jong-Il. How first work, then paychecks, and finally food disappears for the ordinary North Koreans. You can hear the desperation in the voices of the people written about. How they watch helplessly as their children, siblings, spouses, and parents die of disease, malnutrition and starvation. We may never know the true number of victims of the economic collapse and the following famine but it probably topped a couple million people. The people she includes in the book are varied. Old, young, true believers in North Korean society, and doubters. Many westerners think if it's so bad, why don't the people do something. The book gives explanations - the strength of the secret police and gulag system at suppressing dissent and the utter non-existence of information from outside North Korea. When all you hear is that you live in the best country in the world, that everyone else is suffering more than you, why would you try to get out? The last third of the book follows the defectors as they cross into China for different reasons and find different paths, all dangerous, to get to South Korea. Demick talks briefly about how the defectors are helped to assimilate into the society and how hard it is to go from a place where all your decisions are made for you to a place where all the decisions are yours to make - a frightening and parallelizing prospect for many of the defectors. I like the way this book read. Demick has an easy to read style that kept me reading. You feel like you are seeing North Korea through the lives of these people. You see the hope and the despair. We can only hope North Korea can one day find freedom and can rejoin with South Korea without destroying both countries. Our original goal for the day was the monastery in Samos. That would have made for a 22 mile (35.5 km) day. This plan was scratched before we even left the North American continent. Another one of our extra days would be expended and the stage would be divided in two. Cn and friend had left before us without even waking us. I was surprised how quiet they'd been or how deep I'd slept. We collected our stuff and headed out. Gv was in an extra rush today as she understandably refused to use the squat toilet. The Sun rises as we climb up to O Cebreiro. The Camino continues up for a while and the sunrise behind us was gorgeous as it came over the mountains and lit the pastures. Two kilometers up we reached the next town. There was an open bar/cafe and we went in. Gv rushed past me and headed to the bathroom. The bartender started to object (no using the facilities without buying) so I told him not to worry and ordered breakfast for both of us. 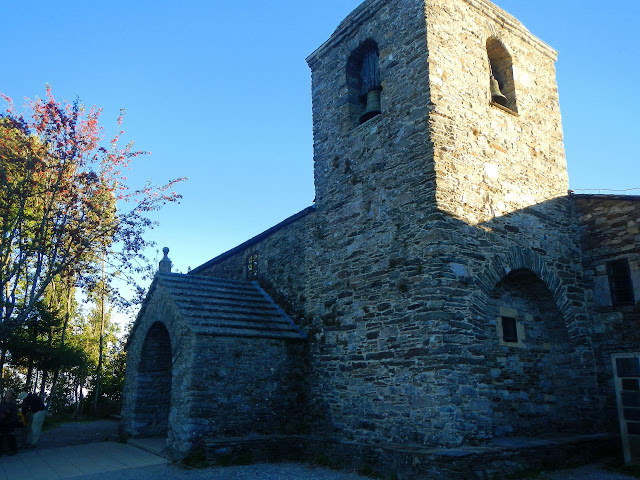 The church in O Cebreiro. Feeling much better we continued to climb up the hill, officially entering Galicia, and continuing until O Cebreiro. We stopped here a bit and we visited the church where I lit a candle for the Wife like I did last time. We enjoyed the sights and went into the shops in this tiny town on the top of a mountain. I bought a rosary for the Wife, several magnets, and new rubber tips for my trekking poles. I would end up wearing out three pairs of rubber trekking pole tips this Camino. It took the shopkeep so long to take my money that I almost gave up and left but I wasn't going to let what happened in Santa Cruz de la Serós happen again. As we looked around and waited for tardy shopkeepers a lot of pilgrims who we'd passed the day before caught up with us. View as we left O Cebreiro. The valleys filled with fog. We left O Cebreiro and continued to climb. We passed through a few small towns that I vaguely remembered from last time. It had been drizzly and overcast the last time I went through here. This time the sun was out and it was windy. In one of the towns we stopped for something to drink. It was much nicer than last time and I was enjoying the day. After visiting another church in the town, we left and hit the last part of the climb for the day. The last little portion turns up steeply and was tough. I controlled my breathing and powered up to the top passing a few people ahead of me. I obviously was feeling much better on this part of the Camino. The hill ends at Alto do Poio. I staggered to a table outside a bar/restaurant/albergue and plopped down. Gv arrived shortly after and we went in and ordered sandwiches and drinks. We ate outside in the sun and recovered from the climb. We talked with a lot of pilgrims that were doing the same. The rest of the day was downhill. We ended in another tiny town, Fonfría. I was expecting a little hole in the wall albergue but I was pleasantly surprised. The albergue was gorgeous. It almost felt like a hotel. It was attached to a bar and had both a dorm and private rooms. I splurged for a private room with it's own bathroom. It was like heaven. People we knew showed up and checked in - a few of them splurging for private rooms as well..
We did our chores and relaxed most of the afternoon. It had been a short walking day but the climb at the beginning had worn me out and I took a long three hour nap in the afternoon. That evening we had a communal meal. Across the road from the albergue in a round building was an awesome restaurant. All the albergue guests were sat at a long table. Once people starting showing up we started seeing people we hadn't seen in a long time. Vn was here and, to my surprise, the Korean couple we hadn't seen since Torres del Rio. You could see the change in the couple. She was no longer wanting to kill her husband. They were walking longer stages. She didn't seem to be fussing over her appearance anymore and she told us her adult children back home had told her they were proud of her - she beamed when she said this. Inside the restaurant where we had our communal pilgrim's meal. There was gossip all up and down the Camino. 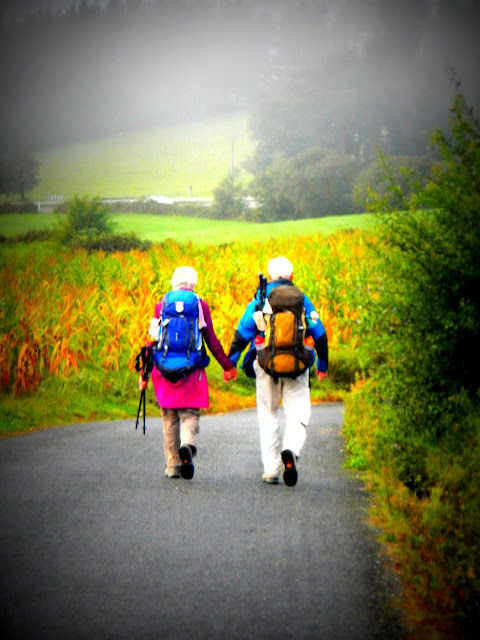 We'd heard of an older man walking the Camino. We had the pleasure of sitting across from him. His name was Mk and he was 91 years old. He'd walked the Appalachian Trail (AT) six times (once was a through hike) and he was hoping to do it again to take the record for oldest through hiker on the AT. He was a character. He'd injured himself and had needed stitches earlier on the Camino. I heard later on that, after reaching Santiago, he took a bus back and walked a part that he had missed when he was injured. He was carrying his own pack. I hope I have his stamina when I'm his age. The food was very good and was centered around Galician specialties like caldo gallego. The food and conversation were a highlight of the Camino. The stars were out as we walked back to the albergue. This would be the last time I really saw the stars the rest of the Camino. The long nap I'd had in the afternoon made it hard for me to fall asleep that night. I rolled and tossed a while before I finally managed to drift off. 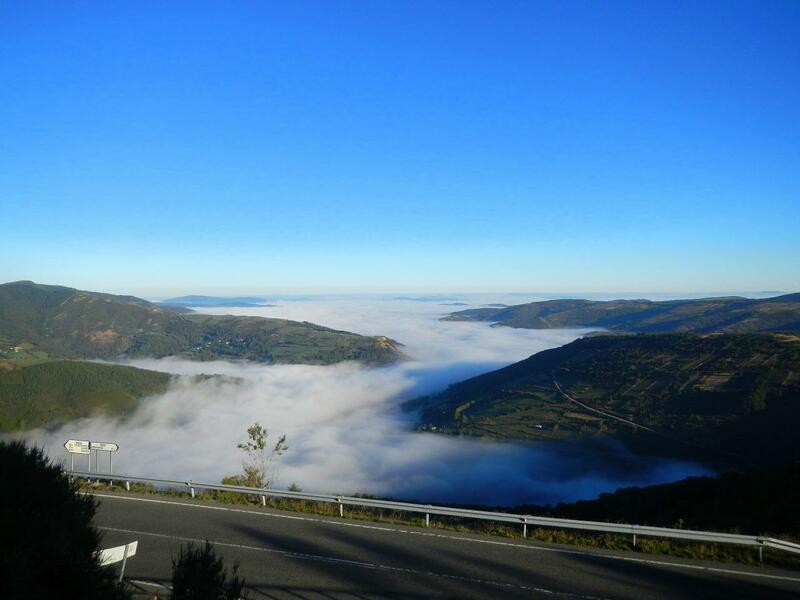 There are two ways out of Villafranca del Bierzo. One takes you along the windy highway past Pereje where I'd stopped last Camino. It also follows a river closely and the sound of water is a nice balance for the traffic noise (not as bad as I remembered but it was earlier in the day this time around). The other way takes you up the mountain away from the busy road and provide a scenic path before rejoining the Camino near the village of Trabadelo. This second way is harder and less well marked. We decided to take the highway route instead. Talking with others later on, the alternate route was not that much harder and was relatively easy to follow. We stopped for breakfast in Trabadelo. 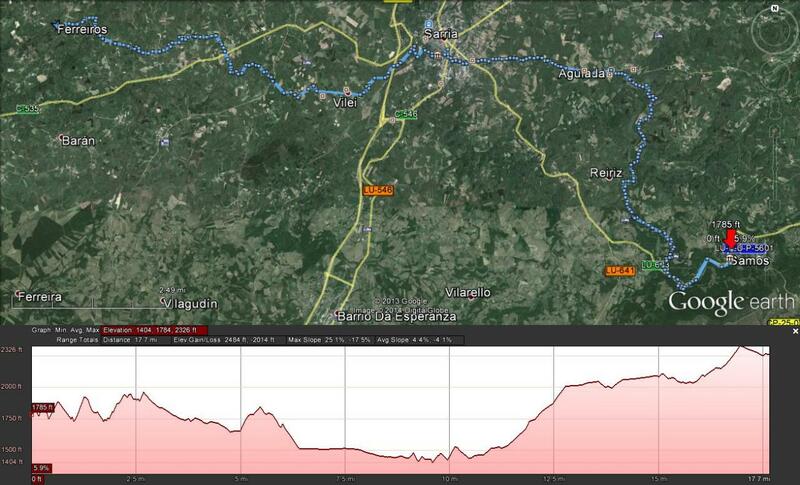 This stage would take us through several towns with lots of opportunities to stop if we'd wanted to. We passed many people we knew including Ma and her friend (still don't remember his name). In the town of Vega del Valcarce, after stopping in a bakery and a pharmacy, I felt something odd in my left foot. It turned out to be another blister on my heel. We stopped and treated it there and then (threaded it and gauzed it). This would be my last major blister of the Camino and the early treatment would prevent it from getting worse. After the town of Las Herrerías the Camino starts heading up - first following an asphalt road and next a dirt trail. I remembered the part along the road but I didn't remember how long it was and how hard it felt. I was happy when we finally got off the road (that is if you could ignore the Spanish pilgrim taking a whiz on the Camino marker). The climb up the dirt trail was just as hard, if not harder, than I remembered from last time. I was very happy once we arrived in La Faba. There are two albergues in this tiny hamlet - both are run by Germans. We headed for the vegetarian one which sounded interesting. 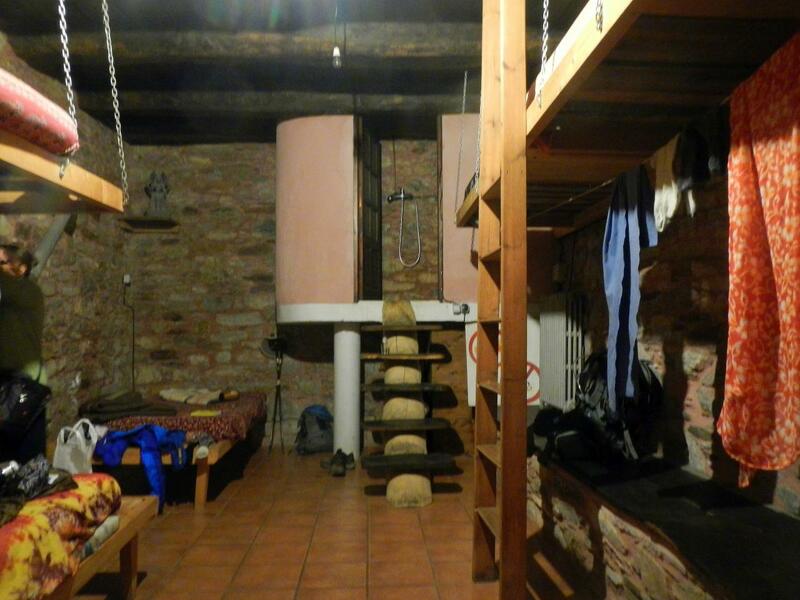 The vegetarian albergue was tiny - only five beds. We were the first to check in. The guy who checked us in was a little spacy. The actual owner of the albergue had run off with a group of pilgrims earlier that week and had left this guy in charge. The dorm room had two beds on the floor (one double bed and one single) and three beds raised six or seven feet off the floor on platforms attached to the wall and chains hung from the ceiling. Very rustic. The bathroom was a tiny room up some stairs at one end. the room had the water heater in one end, a shower and sink on the other and a turkish toilet (i.e. a squat toilet) in the floor that acted as both toilet and shower drain. The vegetarian albergue dorm room. The stairs in back lead up to the bathroom with the turkish toilet. Gv took the larger of the two beds on the floor and I took the smaller. We checked the place for bedbugs and it was clean. We did our chores and headed to the restaurant/bar of the town. The first order of business was using the 'real' bathroom facilities of the bar. Then we ordered some sandwiches for lunch. It was nice outside so we ate our food on a picnic table across from the bar. Here we met more pilgrims including a father and two twenty-something sons from Colorado (Cn, Pk, and their father whom I don't recall his name). Both of the sons were walking with girls they'd met along the Camino. I'd seen the father before in Astorga but hadn't talked with him. Cn had come in late and ended up in the vegetarian albergue with us and his walking partner. His father and brother, Pk, were staying in the other Albergue that was now full. The church attached to the German albergue in La Faba. Wy showed up and asked about a place to stay. 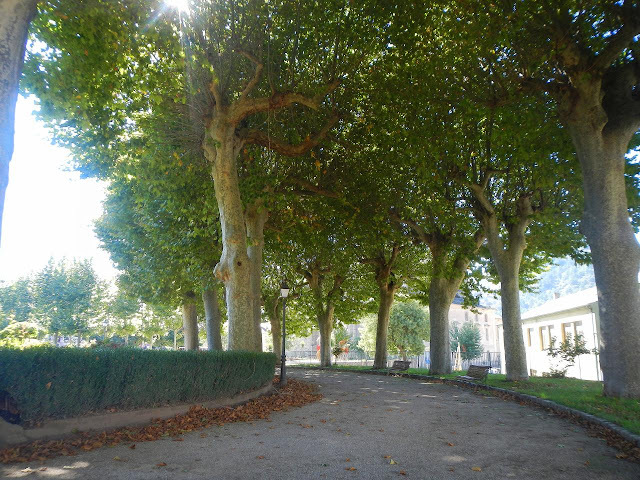 Both albergues were said to be full. He was in bad shape but continued on to the next town two kilometers farther ahead. It would turn out that our albergue actually had two open beds (they had been reserved but the pilgrims who reserved them had gone to the other albergue). We felt bad for him - we didn't know if he'd gotten a bed until we ran into him again farther along the Camino. There were only four people staying at the vegetarian albergue (Me, Gv, Cn, and his walking friend). Since there were so few, a vegetarian meal was not included. We ended up eating in the restaurant/bar we'd had lunch. We sat with a couple of Canadian ladies that we would see off and on the rest of the way to Santiago. I don't recall their names - I didn't do a very good job of writing names down ... shame on me. They were an interesting pair. One was an introvert that really didn't like to be uncomfortable (not a fan of albergues) and the other was outgoing, talkative, and probably open for everything. The gregarious one acted like a buffer for the introvert. The food and conversation was pretty good if I remember right. I had my first piece of Tarta de Santiago, a type of almond cake. It was the first of many pieces. After dinner, and after using the bar bathroom facilities one last time, we went back to the albergue. It was getting dark and, unlike San Bol, the skies were clear. I waited until the moon dropped low on the horizon and went outside to see the stars. The stars were bright and you could see the milky way. As we admired the night sky an old man approach Gv and asked her if she wanted to see his cow. I wasn't paying too much attention to what they were talking about. The man goes away and a few minutes later comes back leading a large cow. I'm not sure what this meant. Was he showing off or was he proposing? I'm not really sure. It was a nice cow though. We went back inside to get away from the chill in the air and the cow in the street. If I recall correctly I fell asleep late here. Cn and friend were out celebrating late into the night and I think I was worried about them waking me up so ... I had a hard time falling asleep. I finally did sleep after all the hill climbing I'd done this day finally caught up with me. *Note: The camera GPS had a very hard time tracking this stage probably because of the steep mountains which the Camino runs along and the trees covering the trail up to La Faba. 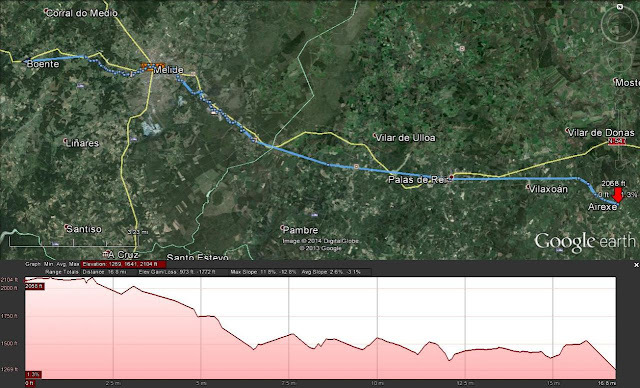 The track is a rough approximation especially after Las Herrerías. I got my first pair of glasses back in 1977 (± 1 year ... it's been a long time). I wore them continuously for twenty-nine years. I can't say I loved wearing glasses but they helped me see and twenty-nine years is a long time to get used to having a minor inconvenience sitting on the bridge of your nose. My lenses were thick and heavy. The bridge of my nose would get sore and sometimes rubbed raw. The glasses would fog up in the winter time. I wished I could get rid of them but without them I could not see. I eventually learned to live with them and these annoyances became inconsequential. In 2005, after a lot of thought and a quite a bit of hand wringing, I decided to do something about it and on January 6, 2006 I had LASIK. I was nervous about it. The idea of someone reshaping your cornea by burning off layers with a laser seems a tad bit risky. All the paperwork you signed before hand tried its best to change your mind delineating all the possible risks and explaining just what could go wrong during the procedure. I sat in the chair anyway and, yes, there was a smell of burning flesh when you heard the click-click-click of the laser firing. It was quick and painless. They told me to come back the next day for a check. When the Wife said she wasn't available to bring me back they said "Don't worry. He can drive himself." They were right. After a drug assisted night's sleep with plastic cups protecting my eyes, I woke up to a crystal clear world. The complications that were warned about - dry eye and degraded night vision - never materialised and my eyes were completely back to normal in two to three weeks. I was very happy with the results but I knew they were only temporary. First off my near vision which had been very good was already a bit blurry after LASIK. This was to be expected. Over the next five years my near vision got progressively worse. This too was expected as it is a result of aging - we tend to become more farsighted as we age. I'd hope to put it off as long as I could but it started to bother me when I read ... my arms weren't long enough and the type wasn't big enough. I went to my eye doctor and after the exam she said the dreaded word: Bifocals. I put it off. I bought reading glasses. They worked. But, over the last three years even my far vision has degraded ever so slightly. This week I gave up and bought my first pair of bifocals. I don't like them. No sir. I've been wearing them for three days which, I know, isn't very long but I am having a tough time adjusting. Apparently when I'm looking far away my nose is slightly elevated which throws off the focus. When I'm reading, apparently, my nose isn't high enough. Not only that but I seem to have a strange tilt to my head and I find the right or left side of my vision is in focus while the opposite side is blurry. I don't even try to wear them when I'm at the computer. I've been spending a lot of time wobbling my head around trying to line up the letters on the page, my eyeball, and the correct part of the lens. Who knew my head was so out of kilter. It's amazing how eight years of no glasses has really altered my perception of glasses. All those inconsequential annoyances have resurfaced with a vengeance. It's like they were saving themselves up the last eight years waiting for the opportunity to pounce. I suppose it feels that way because of my inexperience with bifocals. I just hope I can get used to them soon. Not sure if my tough time adjusting to the bifocals are the glasses or the fact that they remind me that I'm aging. The LASIK gave me a chance to ignore that fact for a few years. Now it's back to reality time. We left Ponferrada and wound our way out of the city. 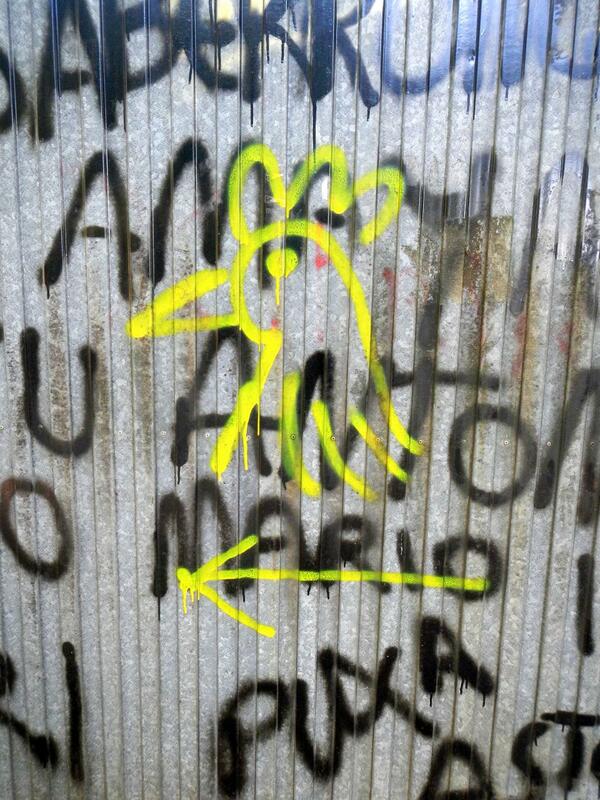 While it wasn't too hard to follow there was definitely a shortage of arrows in Ponferrada. At times it was a tad confusing. Having said this, it didn't feel as bad as the last time I left Ponferrada. Last time it had felt like it took forever to leave the city. Outside of Ponferrada you pass through several small towns. We stopped in Camponaraya for some breakfast and chatted with several pilgrims we knew. Very cool flower on the way to Cacabelos. 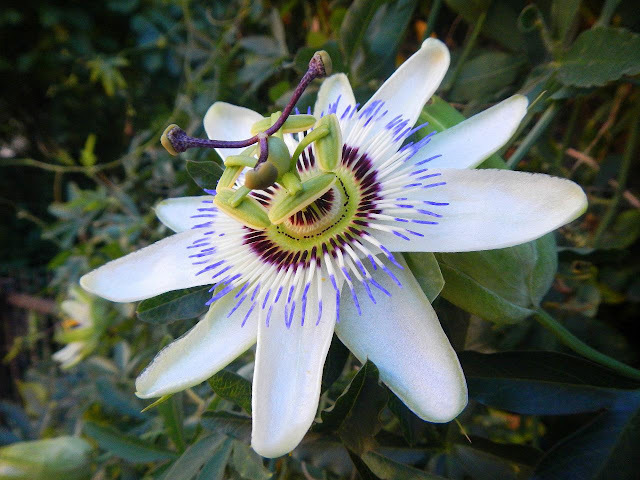 Passiflora caerulea, the Blue Passion Flower. The next major town is Cacabelos. We stopped for a snack/lunch and perused a street market before heading out of town. This next section, between Cacabelos and Villafranca del Bierzo is a strange section for me. Both times I walked it I ended up totally exhausted. It didn't feel particularly hilly or steep but as you walked along the dirt farm road and admired the beauty of the vineyards and the mountains of the area (known as the Bierzo) your energy was just sucked out of you. Last time I met a Puerto Rican whose conversation distracted me enough that I hadn't noticed it too much. This time I noticed how tough it was. A vineyard on a hill. In one small village along the way we passed a Chinese girl we'd seen since Astorga. She spoke Chinese and Spanish but not English which I felt odd. Of course this is a very ethnocentric attitude I guess. You could tell she was struggling too. She looked really tired and we all had a ways to go before we got to our destination. 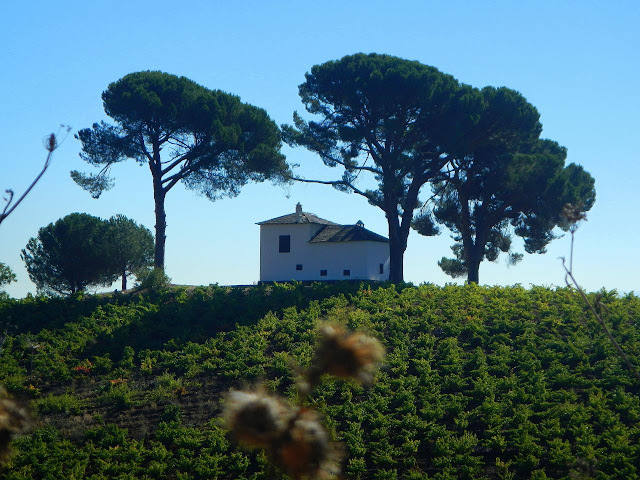 When we finally got to Villafranca del Bierzo I was totally wiped. Gv had read about a recently renovated albergue and wanted to stay there. I was following her through the city passing one albergue after another as we crossed the town. She wasn't sure where it was and I just wanted to get somewhere so I could power down. I was really tired. My thoughts were approaching homicidal as Gv drug me through the confusing streets of this town. Apparently when they were handing out all the arrows to mark the Camino, all of Ponferrada's arrows were sent to Villafranca del Bierzo. There were arrows everywhere. You could walk in three different directions following arrows on all three paths and, eventually reaching the same town exit. Right before I really snapped, we reached the Albergue de la Piedra. We asked for beds and we got the last ones in the albergue. People came in behind us were turned away with an offer from the hospitalero to drive them to another albergue (The hospitaleros were a very nice couple). If they had been completo, I think I would have made Gv carry me to another albergue (It would turn out that one of the other albergues had bedbugs so we lucked out). A lot of our friends showed up here (while the albergue was full the albergue took reservations so some people with reservations showed up after us) and we said our hellos. Vn was there with a friend he'd been walking with for a while. His friend had been bitten by bedbugs the night before. The hospitaleros washed all his clothes, fumigated his pack, and told him what to buy to treat the bites. They went above and beyond and they were just good people. They had a dog who had a habit of laying in doorways. You had to watch your step. He also would sit outside the kitchen and stare at you as you ate like all dogs do. We did our chores including washing the dirt off in a seven head shower (it was pilgrim heaven I tell you). Everything in this albergue, whose building was built around a huge stone outcrop (hence the name de la piedra ... of the stone), was nice. A shady park to rest and wait for the grocery store to open. After our chores we walked around the town, got something to eat, and sat in a shady park while we waited for the grocery store to open. I was tired and I wasn't too enthusiastic about walking around part. The sitting in the park part was nice. The store opened and we bought supplies for the next day and Gv made dinner that night. As we ate I chatted with an older couple from Missouri. This had been a tough day for no real good reason. I was tired and I was happy to get in bed and sleep.